• Clinicians should be completely familiar with package insert before using injection form. Stimulates alpha-adrenergic receptors, increasing blood pressure and causing pronounced vasoconstriction in skin, mucous membranes, and mucosa. Produces mydriasis by contracting pupillary dilator muscle. Adults: 1 to 10 mg subcutaneously or I.M. ; don't exceed an initial dosage of 5 mg. Adults: 0.1 to 0.18 mg/minute I.V. infusion. For maintenance infusion, 40 to 60 mcg/minute. Adults: 0.5 mg by rapid I.V. injection, not to exceed initial dosage of 0.5 mg. Subsequent dosages (determined by blood pressure) shouldn't exceed preceding dosage by more than 0.1 to 0.2 mg; maximum dosage is 1 mg. Adults: One or two sprays of 0.25% or 0.5% nasal solution in each nostril q 3 to 4 hours p.r.n. ; severe congestion may warrant 1% solution. Or 10 to 20 mg P.O. (chewable tablets) q 4 hours. Adults: After topical anesthetic is applied, instill one drop of 2.5% ophthalmic solution into lacrimal sac; repeat 1 hour later. Adults: Instill one drop of 2.5% or 10% ophthalmic solution to upper surface of cornea. May repeat up to three times p.r.n. Adults: Instill one drop of 10% ophthalmic solution to upper surface of cornea as often as necessary. Adults: Instill 2.5% or 10% ophthalmic solution, as prescribed, into lacrimal sac 30 to 60 minutes before surgery. Adults: Before procedure, instill one drop of 2.5% ophthalmic solution combined with a rapid-acting cyclo-plegic into lacrimal sac, as prescribed. Children: Before procedure, instill one drop of 2.5% ophthalmic solution into lacrimal sac 5 minutes after cycloplegic administration, as prescribed. Adults: 2.5% ophthalmic solution applied to dilate pupil, with intraocular pressure (IOP) measured before application and after dilation. IOP rise of 3 to 5 mm Hg suggests angle block in patients with glaucoma; however, negative response doesn't rule out glaucoma from other causes. Adults: Instill one to two drops of 2.5% ophthalmic solution into affected eye. Adults: Instill one or two drops of 0.12% ophthalmic solution into eye(s) up to q.i.d. p.r.n. • In emergencies, drug may be given by direct I.V. injection. Dilute 1 ml of solution containing 10 mg/ml with 9 ml of sterile water for injection. ☞ For I.V. infusion, dilute 10 mg in 500 ml of dextrose 5% in water or normal saline solution; titrate dosage until blood pressure is slightly below patient's normal level or until maximum dosage is reached. Infuse I.V. in large vein (preferably through central venous catheter) using infusion pump. After condition stabilizes, taper dosage gradually; don't withdraw abruptly. Avoid extravasation. ☞ Be aware that systemic absorption of ophthalmic solution during pupil dilation in patients with angle-closure glaucoma may trigger asthma attack. • As ordered, apply a drop of suitable topical anesthetic before instilling ophthalmic solution, to prevent pain and drug dilution (caused by excessive lacrimation induced by pain). ☞ Compress lacrimal sac for 1 minute after instilling 10% ophthalmic solution, to avoid excessive systemic absorption (which could cause serious cardiovascular problems, especially in elderly patients). • Be aware that patients with heavily pigmented irides may require larger ophthalmic doses for diagnostic procedures. • Monitor ECG continuously during I.V. administration; monitor blood pressure every 5 to 15 minutes until it stabilizes, then every 30 to 60 minutes. • Monitor central venous pressure and fluid intake and output. Keep in mind that drug doesn't eliminate need for fluid resuscitation. • Assess CBC; watch for evidence of blood dyscrasias. • Monitor I.V. site; extravasation can cause tissue damage. • Assess for symptomatic improvement in patients using nasal form. ☞ Monitor for adverse reactions, particularly life-threatening asthmatic episodes. • Tell patient to take exactly as directed and not to exceed recommended dosage. • Advise patient using nasal solution that dropper, inhaler, or spray dispenser shouldn't be used by more than one person. Teach proper instillation technique: instill nasal solution into dependent nostril with head down and in lateral position. Stay in this position for 5 minutes; then instill solution in other nostril in same manner. Advise patient to rinse container tip with hot water after each use. Instruct him to discontinue use and contact prescriber if symptoms don't improve after 3 days. Tell him not to use for more than 3 days and to contact prescriber if symptoms persist. • Teach proper technique for instilling eye drops. Stress importance of compressing lacrimal sac after instilling, to decrease systemic drug absorption. 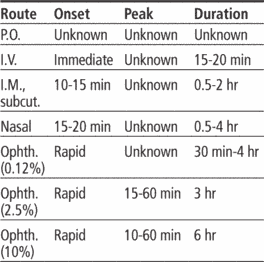 Tell patient that ophthalmic solution may cause light sensitivity lasting several hours. Inform elderly patient that he may see transient floaters 40 to 45 minutes after administration. A brand name for nasal drops containing PHENYLEPHRINE. Kazuo Koike, Executive Director, dentsu X Philippines; Retno Diwati, SEA Regional Manager, Fenox Venture Capital; and Kentaro Hashimoto, Co-Founder and CEO, GNB Acceleration, and Ryan Dominic Sy, Business Development Officer, Venture Capital Holdings Corp(Ph). Alone in Fenox, I walked around Tanglewood, the "cottage" Sturgis and her husband Fewis Tappan had built in the late 1840s. A new venture fund, the Fenox Global Fund IV, seeks to invest $100 million in seed, Series A and pre-IPO funding throughout the United States, Asia and the Middle East. Now open to investors in the Middle East, the Fenox Global Fund IV will seek to invest in information technology startups - including Internet, computer hardware and software, and communications - as well as startups in the area of healthcare technology and clean tech. A $100m venture fund has been announced by global investment firm, Fenox Venture Capital in collaboration with Dubai-based Innovation 360. Investors are a crucial part ofthe process," said Brent Traidman, venture partner at the US-based Fenox Venture Capital. In addition to these large growth houses, Mr Haider met TIE, Fenox, Angel List, Bandwith Capital and several other groups, with whom discussions were initiated for the creation of US-Bahrain partnerships and exchanges. In addition to these large growth houses, Haider met TIE, Fenox, Angel List, Bandwith Capital and several other groups, with whom discussions were initiated for the creation of US-Bahrain partnerships and exchanges. 3], asi como las caracteristicas del soporte tales como: capacidad de cambio ionica, elevada area superficial, estructuras fibrosas y buena capacidad de adsorcion, auxilian en la produccion de radicales activos favoreciendo la formacion de radicales fenox, por la fractura del hidrogeno del grupo hidroxilo del fenol.